First-time candidate and Republican will represent area including Barlow, Barton, Beavercreek, Boring, Canby, Carus, Charbonneau, Eagle Creek, Estacada, Fischers Mill, Mulino and Redland. 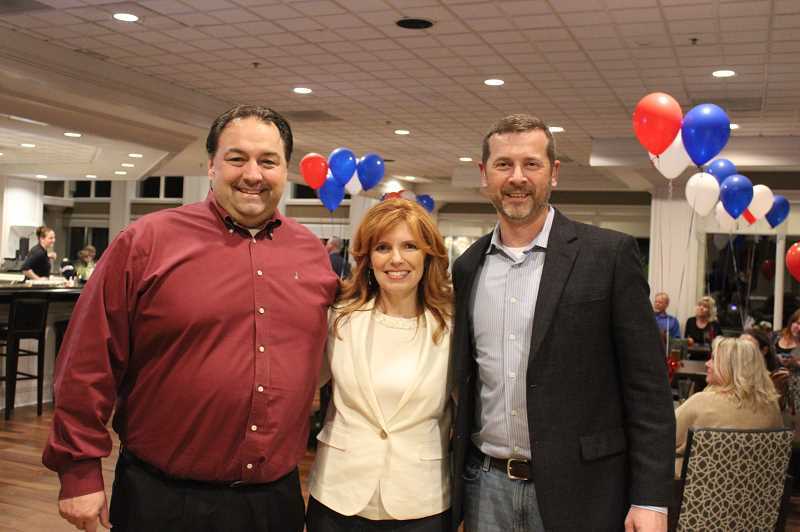 Canby resident Christine Drazan gained her first political office for the Oregon House District 39 seat being vacated by fellow Republican Bill Kennemer this year. She is defeating Democrat Elizabeth Graser-Lindsey of Beavercreek. Unofficial results show Drazan roped in 59.28 percent of the vote and Graser-Lindsey grabbed 40.53 percent. The largely rural HD39 area includes Barlow, Barton, Beavercreek, Boring, Canby, Carus, Charbonneau, Eagle Creek, Estacada, Fischers Mill, Mulino and Redland. "I'm just very humbled by the support," Drazan said as she celebrated among supporters at Willamette Valley Country Club in Canby. "I take the role of representing the community very seriously. I'll go down there and I will represent our community regardless of party and regardless of whether or not people voted for me. I am really committed to serving everybody." Drazan ran in hopes of improving high school graduation rates and reforming the state's spending and budgeting process. She said those are still her priorities and goals, but with election results, she indicated a heightened need to work across party lines. The already Democrat-dominated Oregon House gained three Democrats in the election, giving them a supermajority, or three-fifths majority. "Now that we have election results from tonight and we have kind of a clear sense of what the dynamic might be in Salem, I would hope that we would still have partners in Salem on both sides of the aisle committed to improving graduation rates," Drazan said. "But I think that it's clear, given the numbers in Salem, that I'll have to find partners. "I'll have to be effective at working in a bipartisan way," she added. Drazan got off to an early start in playing nice with Democrats, offering kind words regarding Democratic candidate Graser-Lindsey, who was not immediately available for comment Nov. 6. "It was a very respectful race among the two of us," Drazan said. "I really appreciated the opportunity — I'm a first-time candidate — to be in a race that was civil. I'm really proud of that, and I'm proud of that for both of us." Drazan now heads to Salem for a two-year term representing HD39.